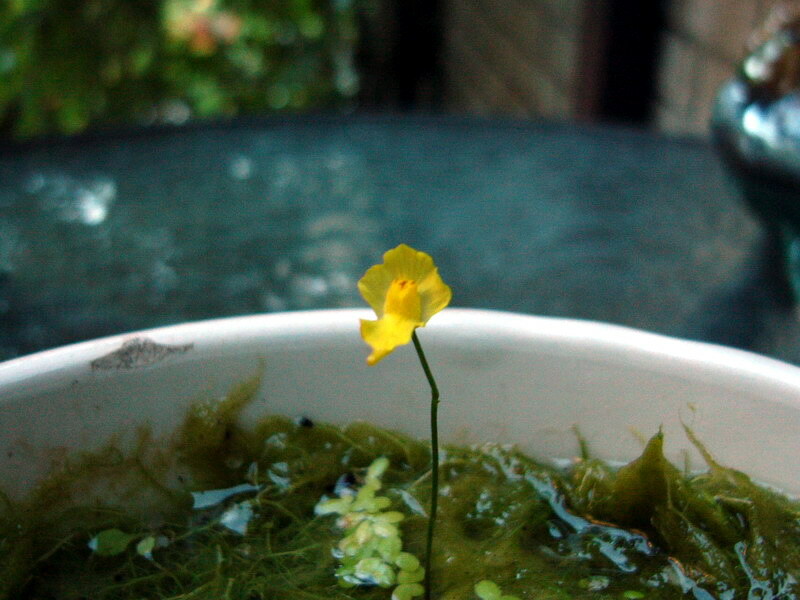 One of the carnivorous plants I keep is the floating aquatic Utricularia gibba. It’s pretty ubiquitous as carnivorous plants go – it occurs naturally on six continents. I think a lot of aquarium keepers despise it as a pernicious weed, but it’s because of its unkillable nature I like it in my tub ponds. To me, aquatic bladderworts are the answer to mosquito control in small water features (at least, ones with plants in them but no fish or fountain). It’s also suitable for small water features because of its small habit. I can’t speak for the aquariumists (aquarists? -dunno what they call themselves), but if it gets too thickly overgrown, I find it quite easy just to pull the clumps out and toss them on the flowerbeds, leaving behind enough to keep the colony going. The only problem I have with it is that it inevitably gets strewn with filamentous algae (a.k.a. string algae) growing through it. In small water features, filamentous algae is pretty simple to get rid of – you just have to twirl a stick through it like a fork in spaghetti, and it comes out. 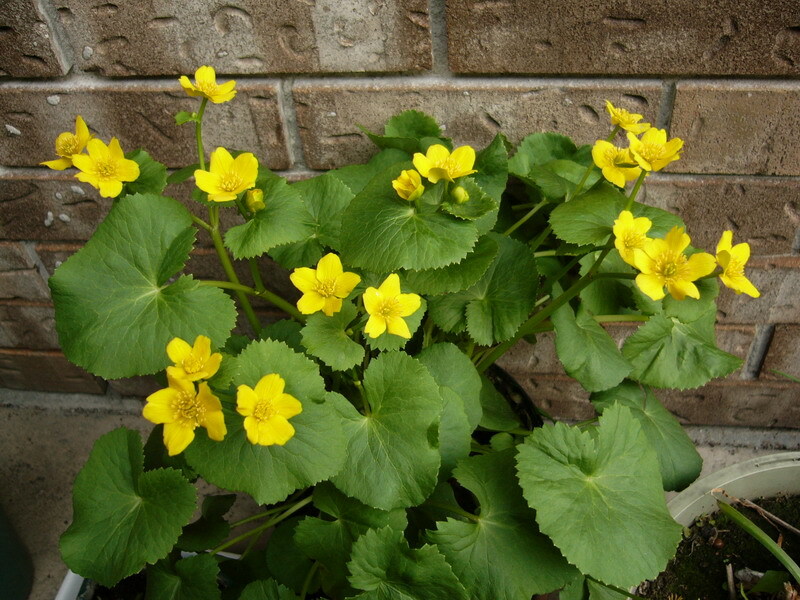 When it grows through the bladderwort, however, it’s impossible to get rid of one without losing the other. Anyway. Utricularia flowers are surprisingly pretty. In fact, most genera of carnivorous plants have attractive flowers. This might be considered somewhat ironic, but on the other hand, these plants are very good at attracting insects, after all. I never got my U. gibba to flower – until now. And it did so under what I consider quite unlikely circumstances. This “specimen” is in a soup bowl that got chipped so nobody wanted to eat from it anymore. I tend to repurpose all sorts of junk into the garden, so in early summer I just dropped some U. gibba into it…and of course some spores of algae came along with it despite my best efforts at picking it out, and somehow some duckweed (Lemna sp.) too. I put the bowl in a part-shade corner and generally neglected it except to add water when I remembered. It basically looks like a bowlful of green muck/slime. Except today I noticed this little gem of a flower sticking out. I’m not sure what triggered flowering – growing in a shallow container? Part shade? Being left undisturbed all season? Dunno. I’m just really glad it happened. Most species of Utricularia need cross-pollination, though, so I doubt I’ll get any seed from it, unfortunately. …by which I mean, the little hexagonal aquarium I’m using to overwinter some aquatic plants indoors. It’s an experiment in more ways than one, because I’m using an ordinary swing lamp with a 60-watt Phillips Agro-Lite bulb as a plant light – “For The Acceleration Of Indoor Plant Growth”. It honestly seems a little dim for 60 watts, but plants perceive light wavelengths differently, so who knows, it might work. To be honest I’m really not sure what I’m expecting from this light bulb, if anything. The plants in question are tropical water hyacinths (Eichhornia crassipes), and tropical water plants like lots of light. Along with the water hyacinths are some floating bladdwort (Utricularia gibba) and the ubiquitous duckweed (Lemna sp.). I’m finding this aquarium to be a fascinating experience, because along with these floating plants came all sorts of little beasties clinging to them from the tub ponds. In the tubs they’re simply not apparent, but in an aquarium with light shining through it, it’s a whole new world in there. I used to keep fish a long time ago, but in its own way this is more interesting. Water hyacinths are extremely good at drawing nutrients from the water column; so much so that aside from their attractive mauve flowers, pond keepers use them to keep the water clean. This means that their dangling roots attract a lot of waterborne detritus; some of this got tranferred with the plants from the tubs to the aquarium, and then knocked off, so there’s a thin, patchy carpet of…muck, I guess, on the bottom. And it’s alive. I’m not terribly good at identifying the things in the tank, because dammit, Jim, I’m a botanist, not a limnologist. The everpresent Physalid snails are there, of course, along with Daphnia and Cyclops, commonly called water fleas. The muck at the bottom gets collected into little tube structures for Chironomid midge larvae (sometimes called bloodworms) to live in. What really interested me were the three (at least) mayfly larvae (probably Baetidae) and the several Hydra creeping through the muck. I’d mistakenly thought the mayfly nymphs were some weird freshwater shrimp at first. Part of me is sorely tempted to add one little fish, just one, to see how it affects this nascent ecosystem. Just as a PSA, water hyacinths are extremely fast spreading and extremely invasive in warm areas. They’re not a problem here because they just wouldn’t survive a local winter, but in many areas they are banned. Even if they aren’t, a responsible pond keeper never ever ever disposes of them close to a natural waterway. If you have them, please be responsible. Regarding the outdoor tub ponds, the water lilies (various Nymphaea spp.) are just about dormant. Soon it will be time to pack them up for winter. The water in the tubs can be saved to top up the aquarium; it probably contains all sorts of interesting things. The plants (viz. last night’s post) arrived today. They were all alive, though one of them was clearly unhappy. So! One northern blue flag (Iris versicolor), a broadleaf arrowhead (Sagittaria latifolia), some floating bladderwort (Utricularia gibba), and a Venus’ flytrap (Dionaea muscipula) have joined the collection. All are native water plants except the last, which is more of a bog plant (native to the Carolinas). Man, if they hadn’t gotten here today, or if they’d been in bad shape, I was ready to breathe fire. Anyway, it has to be admitted that people who know of the Venus’ flytrap are often disappointed by other carnivorous plants; the VF is one of relatively few that have active traps (i.e. ones that actually move on their own). The small ‘bladders’ that give bladderwort its common name are basically just sacs that operate on a valve and negative pressure principle: when sensory hairs on the mouth of the trap are triggered, the valve flies open and water and whatever triggered the trap gets sucked in and the valve closes. It all happens in less than a second. Water gets pumped out, decreasing the internal pressure and thus resetting the trap. This particular species is a small one suitable for tub gardens, but it has correspondingly small traps. I got this species knowing that many carnivorous plant enthusiasts and aquarium keepers consider it something of a troublesome weed. That way at least I know it won’t be fussy. And the flowers are pretty. But the real point is to remove mosquito larvae without insecticides or having to worry about fish. It has, however, been some years since I’ve had a Venus’ flytrap and I’m out of practice. Other than these new ones, the only other carnivorous plant I currently have is a tropical pitcher plant (Nepenthes sp.) (did I mention someone killed the others?). I would really like to get my hands on the native pitcher plant: Sarracenia purpurea subsp. purpurea, but for various reasons haven’t been able to yet. And one or both of the native butterworts, Pinguicula villosa or P. vulgaris. And possibly the native Drosera rotundifolia. Unfortunately, garden centres, when they carry carnivorous plants at all, tend to carry non-native species that need special care, or odd hybrids and cultivars, which I’m simply not crazy about. No big deal. I’m patient.